The spider is non-fail-safe and thus acts as a fuse to prevent equipment damage in the event of torque overloads. It is radially removable, meaning that neither hub (or driver/driven equipment) has to be moved to replace the spider. This saves time and money in maintenance costs. The retaining ring which encloses the In-Shear Spider has 6 Pins which slide into grooves in the perimeter of the spider and twist-lock into place. It will not work its way loose and since there are no fasteners, maintenance/removal of the spider takes only a few minutes. This coupling uses the standard L-Type and C-Type Jaw Coupling hubs. Existing applications using in-compression spiders can simply be retrofitted with the new In-Shear Spider if the features are beneficial. 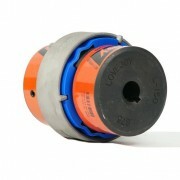 The Jaw In-Shear spider is made from Urethane and has different power ratings to the standard jaw coupling. It also uses different service factors.